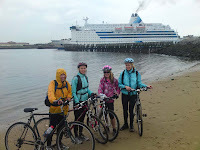 So our task was to bike coast to coast across England from Whitehaven to Whitley bay on the Coast to Coast bike route (C2C). Each summer, 15,000 bikers achieve the distance. What’s to go wrong? Challenge no. 1 was to achieve the 2 hour car journey to the start of the course, first B&B’s close of business at midnight. The holiday started off on the right foot. Approaching set off time got a call from Caroline dropping the bombshell ….”Bike’s not going in car…” . The quick release on front wheel turned out to be not quite so quick release. Not even trusty old WD40 would do the trick. Instead, every passerby having the misfortune to walk within a radius mile of Caroline’s parked car was offered the once in a lifetime opportunity to remove the wheel, with the rather lucrative reward of getting oily hands for the privilege. Finally, the back wheel was removed. Eventually we set off. The journey was further halted by my insistence at doing a quick stop off at Forton services to collect shoe overlays from a fellow biker. With 10 mins to spare, all five bikers were installed in the B&B. Day 1- 46 miles. I fell over the handle bars and got intimate with a roadside bank. For a short while, the group also got split three ways, and I got lost in a pine forest with friend Ali pursued by a digger resembling an inhabitant from Jurassic park. The jagged rocks set up my hybrid tyres perfectly for days 2 and 3. With our first day tiredness set in, some unusual road signage initially baffled us. Ever seen one of those red triangular red warning signs danger “squirrel ahead “? Anyway, we were relieved to see no signs of any threatening 6 ft tall squirrels. Day 2 – 40 miles. Met office severe weather warnings. Serial climbs up to 2000 feet. Yikes. The highlight was shivering to bone at 1903 feet in wet weather gear amongst 40 other push bikers trying to dry gloves over a log burning stove. Two of us were in need of knee replacement and popping painkillers. My back tyre gave up, fortunately help was on hand with Cherry’s boyfriend Mick having a spare 26inch tyre in his supplies. Whilst the rest of the group were mountain goats on wheels they nearly got pneumonia waiting for Sarah on bleak moors. Chorley 4 Mile Trail Race. Wed 5th Aug.